Getting the right translation app for your needs is important. 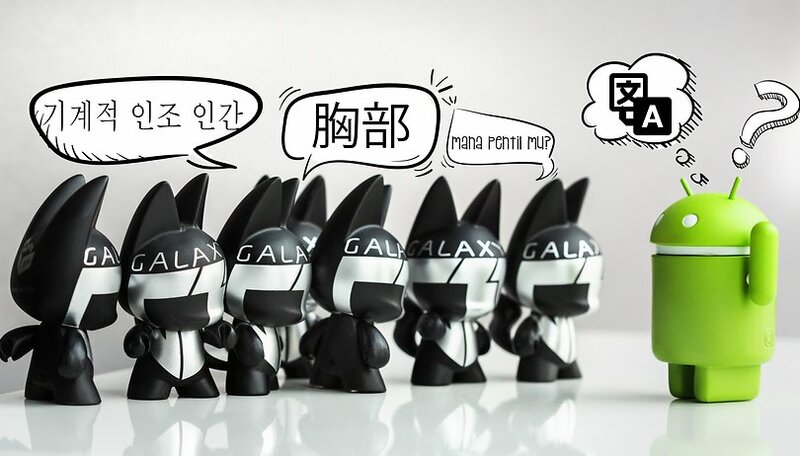 Here at AndroidPIT, we've tried out tons of translation apps for many different purposes and compiled the top picks into one comprehensive list. Here are the best translation apps for Android to help you beat the ancient curse of Babel. If you need a translation app that does everything you need – plus things you never thought you needed – then Google Translate is the right choice. It works with any Android app so you can quickly translate within WhatsApp, Facebook Messenger, Evernote, Google Chrome, Feedly, etc. If you need a solid multi-function translation app, then Google Translate is your best bet. The type-translate function currently supports 103 languages, which can be translated either from via your camera or when simply typing. However, two-way automatic voice translation is limited to 32 languages for now. We tried out Google Pixel Buds for real time translation. Is it a viable solution? The coolest feature of Google Translate is the instant camera text translation, which instantly translates public transportation schedules, warning signs, menus and much more. The size or font of the text does not matter - it will be instantly translated. This function is limited to 37 languages, but works incredibly well. You will be amazed at the number of instances where it comes in handy. Plus, once you download the relevant language packs, you can translate while offline. Microsoft jumped into the Android translation market with this simple and sophisticated app. It's designed for offline use and supports 42 languages. Getting them is easy - you just need to download each language individually. Each one is around 200 MB and can be used for offline translations once downloaded. The interface for Microsoft Translator is practical and well-designed. When you open the app you are given four buttons for quick access. You can choose speech detection translation, keyboard translation or two-way translation. While the interface is much nicer than most translation apps, Microsoft Translator is not a versatile translation app. It doesn't translate text as instantaneously as Google Translate. The app does support Wear OS and this can give you quick translation access that other apps cannot. Translate Voice has the best voice recognition of any of the translation apps we could find. You can say a word or read an entire paragraph and the app keeps up with you. It is dependent on your smartphone's voice recognition capabilities, so results may vary. Translate voice has the best voice recognition of any translation app. This app is especially helpful for when you are in social situations where typing is impractical. With Translate Voice, you can say phrases and then play the translation aloud to the other person. Translate voice is limited by its number of usable functions. If you need something that is more thorough in its translation services, you should probably try one of the other translation apps. Dictionary Linguee is a powerful multilingual dictionary and language app that offers a ton of functionality without in-app purchases or even ads. It supports Spanish, French, German, Portuguese, Russian, Chinese, Japanese, Italian, Dutch, and Polish. Aside from simple word translation, the app also offers offline support, example sentences, audio pronunciations, and a fast integrated search function. The UI is clean and intuitive. If it supported more languages it could easily rival Google for versatility. Yet, the languages it does support boast high accuracy and there aren't any annoying ads spoiling the experience. If you need help with one of the above languages, Dictionary Linguee is one of your best options. If you want a translation fast on a simple interface then Easy Language Translator is your best bet. This app was developed with ease-of-use in mind and is ideal for beginners. It has just two translation functions – typing and speaking – and they both provide quick translations. Easy Language Translator's buttons are relatively large and have flags next to them so you can quickly distinguish between the languages. The large font size makes it easy to see your translations. The app only has a few functions but that's part of what makes it so easy. The default settings are user-friendly, but you can customize them to make the app even better. There are 10 font sizes and six themes. You can choose which functions you want, such as dictionary, phonetics and corrections. PONS Online Dictionary is a dictionary with translator functions, which means it can give you in-depth descriptions of words. Words often have several meanings, so PONS gives you a few options displayed in a simple interface. The word 'current' could mean 'electrical current' or 'new' and it can be either a noun or an adjective. If you need to find the intended meaning, in order to get the right translation, PONS is great at helping you figure it out. PONS is also good for finding and translating phrases in which to use these words. A suggested phrase for 'current' is 'this version is current', which is immediately translated on the other half of the screen. This gives you a better understanding of the word's use in both languages. If you need a sentence or two translated, iTranslate will give you the most accurate results. It is equipped to handle more than 90 languages. And though this is just a small fraction of the total languages in the world, it can be useful in the majority of situations. iTranslate is also the best app to use for typing or copying text. The swipe feature quickly copies blocks of text and translates them effortlessly. If you find something in your translation that you may need later, you can also save it in your favorites. While the voice recognition is not the best, it does have an amazing audio function that can read back translations in different dialects. For instance, you can choose between British, American and Australian English. You can also have the text read back to you more slowly. Whether you're traveling or sending messages to friends from around the world, it can be a pain to jump from app to app just to send a message in another language and translate replies. With GBoard, the keyboard app from Google, this problem is finally solved. It's a multi-lingual keyboard with a translator built right in! You can use its many keyboard configurations to type in multiple languages. You can switch between your native language and any of your other secondary languages just by holding down the space bar. It will auto-correct and make suggestions for any of your enabled languages. But the real magic is that Google's keyboard has Google Translate built in. That means you can type in your native tongue, and it will translate into another language instantly as you type. Just select the language you want it to translate to, and it will translate simultaneously as you type - word by word. You can then edit the result as you see fit before sending the message. GBoard also has built-in search functions if you want to look up words, and you can copy and paste replies to translate them to a language you can read. What do you use translation apps for? What do you think is the best translation app? Let us know in the comments. To my opinion the best translation is Deepl.com. I use it on Android and my Chromebook. Far better than the Android version of Google Translate. Just try on a complex text and compare the results. I noticed that the Google APK of Translate is far less powerful than the desktop version. I noticed too that translating with a photo is far more efficient with Microsoft Translator, which is able to translate the picture of an entire page. Google Translate works only by line. I'm a blogger and with Deepl.com I can translate complete web articles quite automatically, without having to make many corrections. The Google Translate APK, does not. I appreciate Microsoft and mainly Google translators because it is very easy to use, but for delicate or precise translation www.deepl.com seems generally better. Michel - deepl has a limited number of languages to translate to. Google Translate does the job quite well. For long articles, I prefer to read my main ideas using an automated translator. I use both Google Translate and Bing Translate. Even if the translation is not the best, I can figure out the value of the article and then read the English, and just the words and phrases I do not know or I am not sure I'm looking for in the dictionary. For beginners, for advanced, for professionals, to communicate in any other language and with anyone, these automatic translators are a real help. With their help, the world is closer to each other. The article said that Microsoft Translator is best for offline use. Why is this the case when Google translate has offline options? What does Microsoft Translator do better in this regard? Google Translate is still the king. Not perfect but still much better than the Bing/Microsoft translator. It will be when offline voice is available. I want a PAID translator (English/Spanish) app so that I don't hve to endure the constant ads in most Android translation apps! I am looking for an app that supposedly will translate immediately as you are speaking...anyone aware of such an app? I am going to Romania this month. What I would like to find is a translator that would accept my voice in English and be able to translate it to text or audio. Likewise, a person from Romania could input their language and have it translate to English. Does Microsoft Translator do this? Very nice, but what I am looking for is an in app translator. I hate having to move from one window with copy and moving to another window to paste and then back again. Has anyone accomplished this yet? I have Google translate - it does SMS (text) but not anything else. Thanks. Yes, it is called App Translator, and I'm its developer! App Translator directly translates other apps by displaying an overlay with the translated text over the original, without need for selecting, copying, pasting, or switching apps. link: play.google.com/store/apps/details?id=org.pjf.apptranslator . downloading now, I'll keep you informed. Google Translate can be used in apps now. I would definitely go for google translate this time due to the new translate anything update go to messages or sentence anywhere in your phone and select the text to be translated and Google translate will translate it. I'm planning a multi country European vacation soon. I'm going to have to play around with a few of these to see which one will be the best for quick translations. So far I like Google, and I've had the Microsoft one. iTranslate seems like a good one to download and tinker with. There is no link to download Microsoft Translator. I suppose the comical question is, since I don't know the language, how to know the translation is any good? Update 1 - the May 2016 update to Google Translate radically reduced the sizes of offline files (along with some GUI improvements for use in other apps) and permits moving to microSD - French is now less than 30mb. I see that MS still has massive language files for offline - they're mainly text, so why? Update 2 - solved a crazy problem with stalled downloads of Google Translate offline files, figuring out that a system-wide ad blocker prevents the download (it also blocks Firefox Focus downloads, but not Chrome or anything else). Whitelisting affected apps in the ad blocker cures the problem. Microsoft Translator should work for you Albin. You just have to download the language first on Wi Fi. I have installed a couple of them to check out and have used Google translate which I have found helpful for translating emails and websites. Thanks for the additional apps to check out. Thanks a lot for the tips! Very useful article. Till now have been using only Google one. Me too! For the first time perhaps, Microsoft's app seems to be the one that I need. Mmm, thanks for this list. But I would have appreciated it even more if you informed us about the offline possibilities of those apps too. For obvious reasons..
Glad to hear surya, it certainly makes things easier if you need most of it's functions. Have you tried others?